Home Latest News Why can’t we talk about periods? From ‘Auntie Flo’ to ‘time of the month’, how many ways can you avoid saying the word ‘period’? Whether it’s menstruation or menopause, talking about periods has often been a taboo subject. But later this year a period emoji – a red droplet symbol – is being launched. So it seems now is as good a time as any to speak to some of the women trying to end the shame and eradicate period poverty. The addition to the emoji library follows an online vote by Plan International UK in 2017 for what a period-themed emoji should look like. The most popular choice was a pair of pants marked by blood but that was rejected by the Unicode Consortium, so the charity teamed up with the NHS and pushed for a blood drop instead. Lucy Russell, head of girls’ rights and youth at Plan International UK, told the BBC that the silence around periods has had “a negative impact on girls – girls feel embarrassed to talk about their periods, they’re missing out, and they can suffer health implications as a consequence”. So, why is talking about menstruation so difficult? 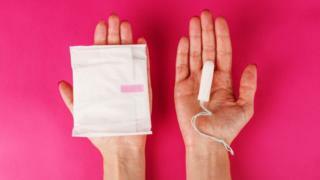 “If you’re a girl who lives in a single-parent family with your dad, you could be too embarrassed to ask about your period or for sanitary products,” Claire Best, a volunteer for The Red Box Project NI, told BBC News NI. “Periods can be really difficult for people, especially for younger girls. The Red Box Project was set up in England in 2017 in a bid to combat girls missing school because of their periods. It is estimated about 137,000 girls in the UK miss school each year because of a lack of access to sanitary products. Relying on donations, red boxes filled with sanitary and hygiene products and new underwear are placed in schools and with other organisations. Using the service is free, and designed to be discreet. “It’s crazy that we’re still talking about the stigma attached to periods when it’s something that affects every woman,” said Claire. “Last week I gave sanitary products to St Louise’s College in west Belfast, who were down to their final pack, and there’s a red box in Kilcooley Primary School in Bangor which has been great. While the uptake is less than what it would maybe be in a secondary school, because of age, it’s getting young girls talking. “They have time to have a look at the products properly, which they would never do in a chemist, and it makes them aware that it’s OK to talk about periods. For some people in Northern Ireland, a difficult choice has to be made between food, warmth and sanitary products. Some local authorities are looking at the issue – on Monday, Derry and Strabane District Council will be the first one to offer free sanitary products in some of its public buildings. Elsewhere, campaigners and charity workers are trying to tackle the problem. 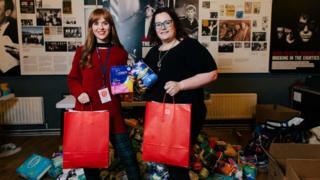 Katrina McDonnell, founder of The Homeless Period Belfast, which provides ‘period packs’ for those in need, told BBC News NI: “Some girls have had to use a sock or the same menstrual item throughout the whole duration of their period. “I know of a rough sleeper who asked a passerby for money and was denied her request, being offered food instead. Last year councillor Sian O’Neill put forward a motion to consider the feasibility of Belfast City Council providing free sanitary provisions in its buildings. “Firstly we have to talk about periods in our social circles and in everyday life. We have to be able to say the word and talk about it freely in our homes,” she told BBC News NI. A 'Power-Up' For Commission Gorilla - Early Adopter Access + Black Dragon Protocol Video Bonus.